Minitrix AT & SF N Scale Locomotive N 9MM 3260 ST 2073 00. Condition is Used. Shipped with USPS Priority Mail Small Flat Rate Box. See Photos. Engine is in very nice condition. Cars need to have wheels mounted. Cars include Peabody Short Line, Carnation Evaporated Milk, Bachmann N Gauge Trains, National Cylinder Gas, Burlington and Santa Fe. 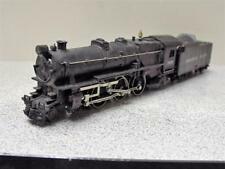 N SCALE MINITRIX STEAM 4-6-2 CANADIAN PACIFIC NO BOX RUNS GREAT.Engine has been serviced and ready to run .Engine has been serviced and ready to run . I SEE NOTHING BROKEN OR MISSING. PLEASE LOOK AT THE PICTURES FOR GREATER REFER TO PICS. FOR OTHER DETAILS. THE LUCKY BUYER WILL BE THRILLED! Thanks for looking. As per Ebay protocol, acknowledgment by winning bidder is expected within 1 business days and remittance is expected with 1 days of auction’s end. PAY PAL PAYMENTS PREFERRED Shipping costs will be greatly reduced for multiple wins. INTERNATIONAL BIDDERS MUST PAY WITH PAY PAL.SHIP INTERNATIONAL PRIORITY MAIL ONLY. N Scale KATO Red Electric Locomotive SBB CFF FFS. Like new condition, mssing buffer. Serviced and track tested. Please refer to pictures for greater detail as they are a part of the description. N-SCALE MINITRIX GRAND TRUNK WESTERN 8-DOOR BOX CAR (LONG) IN SUPER CLEAN COND. N-SCALE MINITRIX GRAND TRUNK WESTERN ( "LONG" 8-DOOR BOX CAR ) IN BOX IN SUPER CLEAN PREOWNED CONDITION. GREAT BOX CAR FOR YOUR LAYOUT. Transformer worked when tested. Transformer is scratched and roughed up in places. Approximately 4.25" long. TRIX N STEAM FRANCO CROSTI BR01 BLUE SUPER RARE GREAT CONDITION FOR THE AGE. TESTED AND RUNS GREAT. PLEASE LOOK AT THE PICTURES AS THEY ARE PART OF THE DESCRIPTION. Sir Nigel Gresley Steam Locomotive. This Limited Edition N-scale Sir Nigel Gresley Steam Locomotive Set #1022 is in the original case and has never been used. A 23 page history of the train is included. It is in the original box. 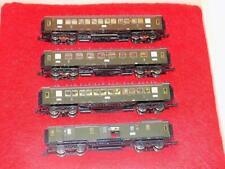 N Scale Minitrix Nostalgic European Lighted Passenger Car Set (4 cars). All cars are lighted with flicker-free LEDs and rectifiers. In custom wooden case. Like new condition. Please look at pictures for greater detail as they are a part of the description. For your consideration is a rare, unused N-scale Minitrix train set from Western Germany., original extra thin-gauge wiring, bumper sticker, instruction manual, and best of all the 4 train cars shown. Made in Austria. Pre-owned condition. Minitrix Model Train N-Scale 9mm Cat# 2010. Amtrak #702. Special Features :Special Edition - I believe this car was build out of the Ford issued Freight Car Building Kit. Item: Long Box Car Ford. Box: Sorry no Box. Condition: Like New. Minitrix Britannia N Scale Train Set. It is a limited edition train set and collector's item. The set features a Steam Locomotive replica of the British Railways (BR) Standard Class 7 (also known as Britannia class). 1:1 Scale Weapon Models. Super Scale Int. Reality In Scale. Master Model. Mantis Miniatures. Failure to comply with this will result in unpaid item filing. Yahu Model. WingNut Wings. Upon receipt and inspection. If this occurs, we will let you know. Minitrix 12445 Steam Loco w/ Tender DB Br 003 N Gauge T ested and oiled. Runs strong and lights work. Length over the buffers 150 mm / 5-7/8". 4-6-2 design. N Scale Minitrix SBB FFS CFF Swiss Electric Locomotive W/ PROFI Couplers. Like new condition, no box. Please refer to pictures for greater detail as they are a part of the description. In very good condition and looks lightly run, but could use a little cleaning.The case is an Atlas case and is in fair shape. Minitrix N Scale Locomotives. NEW! Selling 2 vintage old minitrix locomotives. N Scale. Inherited from my grandfathers collection. These are minimum 30 years old. The larger one is brand new in original packaging. Never used. The smaller one has packaging but it is not complete. These are very nice pieces and very rare. Made in Austria. The red lettering on each is a slightly different shade of red (see photos.). Pre-owned condition. Model Number: 3221. Type: 40’ Cattle Car. Reporting Marks: CP. Rail Line: Canadian Pacific. All of our trains were from a set my husband and father-in-law put together in the 70s and 80s. Condition: C-7. 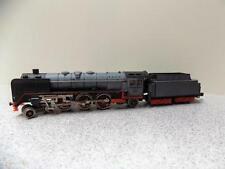 MINITRIX N Scale 4-6-2 Steam Locomotive. Engine and Tender AT&SF 3420 #51 2990 00. Item: Gondola. Box: Original. Special Features :The Box shows minor age wear. make Supersized seem small. Get images that. Only ran at Christmas by the owner. This is from his estate. This Evening Star collectible limited edition N-Scale Train set #1032 is a historical representation of the British Railways Locomotive. It includes the 2-10-0 Locomotive with tender and Five (5) Passenger cars. MINITRIX N SCALE. "DER ADLER" SET. And this is a very reasonable fee to ensure your item arrives safe and sound and intact! LIMITED EDITION. LIKE NEW CONDITION WITH ORIGINAL BOX, BOX SHOWS MINOR SHELF WEAR. Item: V261 626-6 Diesel Switcher. Get Supersized Images & Free Image Hosting. The decoder has a 6 Pin Plug and all you have to do is to exchage the 6 Pin Board inside the engine with the decoder. Once the decoder is installed it will run on DCC and DC. ESU 54613 6 Pin LokSound Decoder. NO TENDER LIGHT. Engine runs smooth in both directions, headlight works. Original box with insert Item equipped rapido couplers. MISSING BELL I have listed this item as USED because I am not the original owner. Realistic detailing and painting.Although the item has been test run it should still be run through your roundhouse, because it has been in storage. Used but in great shape with original case! N SCALE MINITRIX DOUBLER DECKER RED SIHLTAL BAHN LED LIT DC OR DCC RARE A . I SEE NOTHING BROKEN OR MISSING. PLEASE LOOK AT THE PICTURES FOR GREATER REFER TO PICS. FOR OTHER DETAILS. THE LUCKY BUYER WILL BE THRILLED! Thanks for looking. As per Ebay protocol, acknowledgment by winning bidder is expected within 1 business days and remittance is expected with 1 days of auction’s end. PAY PAL PAYMENTS PREFERRED Shipping costs will be greatly reduced for multiple wins. INTERNATIONAL BIDDERS MUST PAY WITH PAY PAL.SHIP INTERNATIONAL PRIORITY MAIL ONLY. WE WILL ACCEPT INTERNATIONAL BIDS ONLY WITH THE FOLLOWING CONDITIONS:"PAY PAL ONLY" (1) You understand that the ONLY way we ship out of the country is via US Post Office Express Mail International or Priority Mail international depends on the total value - NO First Class NO Exceptions. In excellent condition and looks lightly run. The case is very good shape. From my father's collection. Dr. Tom Catherall was the digital consultant for Märklin Trains for decades and amassed a large collection of trains and accessories. Item: Passenger Car. Box:O riginal. Special Features:The Box shows wear. make Supersized seem small. Get images that. TRIX MINITRIX N Scale 15143 Bavarian Set K.Bay.Sts.B. New in original box. TRIX MINITRIX N Scale 15143 Bavarian Set K.Bay.Sts.B. New in org. Great condition, may have never been used. Its a good looking engine. Tested and works very well, smooth and queit. OB with papers. ANY and ALL batteries. are AS IS. Great for any train enthusiast or collector. Boxes are not free, and special handling as well as materials cost money. We are glad to do this! BUT… if you want it we will find a way to get it to you….